Millions of children live in the Indian slums with no opportunity to receive an education, let alone any normal sense of nourishment or hygiene. 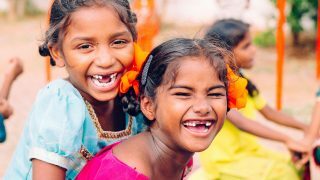 Our education center, “The Children’s Hope Center” founded in 2010, is located in one of the largest slum areas of India, in the city of Hyderabad (pop. 8 million). We’ve been able to help several children identified as meeting our profile for at-risk candidates, namely children aged 5 to 7 living in shanty homes in the slums, found scavenging in the main city trash heap looking for recyclables on behalf of their parents or relatives. Our education center provides a well-rounded education including a computer lab, hot meals, hygiene supplies and medical care for the new students enrolled. Through this program, we’re seeking to attack the core issues that perpetuate the cycle of extreme poverty and put children at risk for human trafficking. Unfortunately this program is on hold as we navigate local sensitivities in the slum colony where the facility is located. Pray with us as we hope to see the center re-opened for the 2018-19 school year. We are so grateful for your support of this program for so many years as we were able to assist almost 200 students since its inception.